Retinal Detachment - Associated Retinal Consultants P.C. Retinal detachment is a common cause of visual loss where the retina is separated from the underlying eye wall. Retinal detachments occur in approximately 1 in 10,000 individuals. They are more likely to occur in individuals with predisposing risk factors, such as previous trauma or eye surgery, a high degree of near-sightedness (high myopia), or in eyes that have predisposing lesions in the peripheral retina such as lattice degeneration, or thinning of the peripheral retina like stretched out pizza dough. 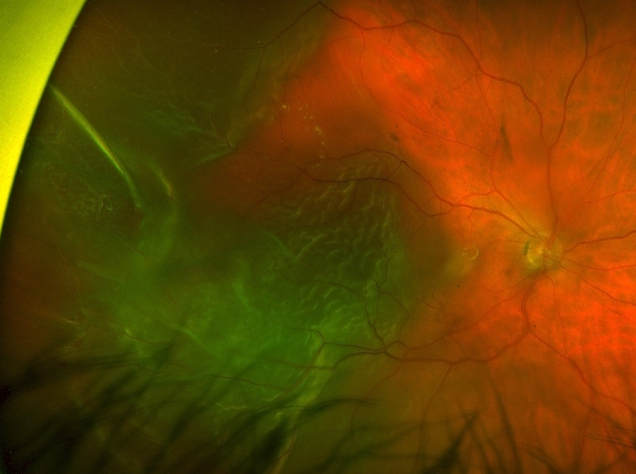 Fundus photo of a macula off retinal detachment. View after treatment with scleral buckle and pars plana vitrectomy for retinal detachment repair. There are three main types of retinal detachment: rhegmatogenous, serous, or tractional. Rhegmatogenous detachments are those where a hole or tear occurs in the retina which allows fluid to flow between the retina and the eye wall, thus causing detachment. Serous detachments occur when an inflammatory process causes excess fluid to seep into the potential space between the retina and the eye wall while the retina itself is intact. Tractional retinal detachments occur when proliferative membranes or scar tissue contract and pull the thin retina tissue up away from the eye wall. These commonly occur in patients with advanced diabetes, prior trauma, or surgery. 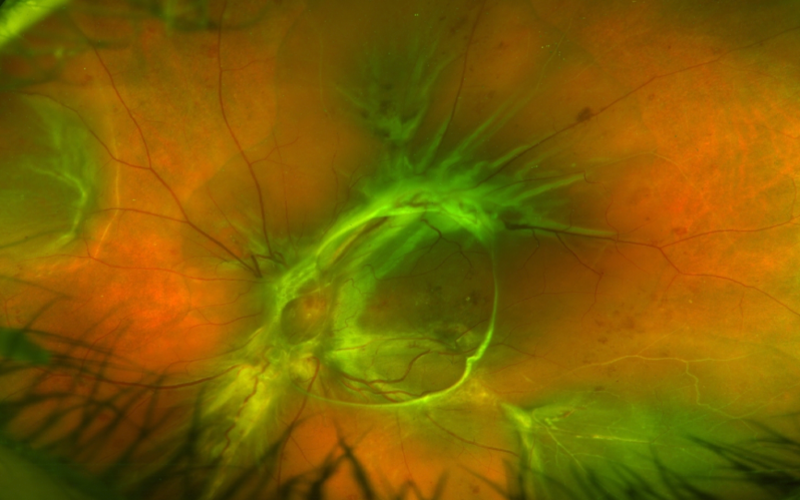 Combined tractional and rhegmatogenous retinal detachment (TRD/RRD). Your doctor will do a complete eye exam including a dilated examination to look for any retinal tears, holes, or predisposing lesions. 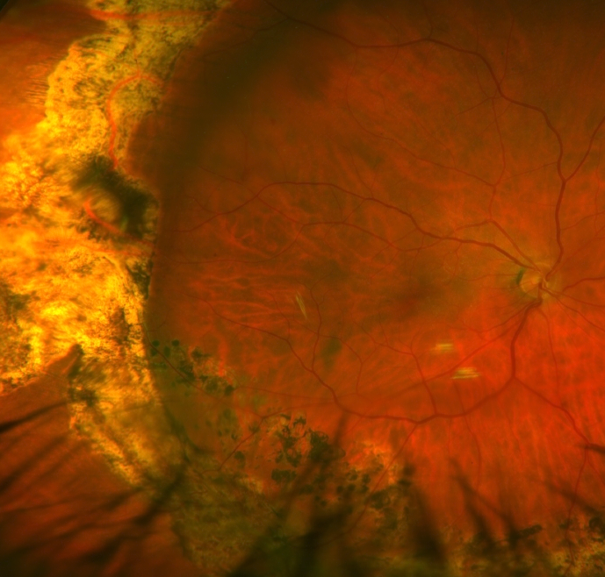 Your doctor may order fundus photography to document the extent of the retinal detachment or confirm whether or not the macula or fovea are involved in the detached portion of the retina, as this has prognostic and treatment implications. If there is significant cataract or bleeding inside the eye that clouds the view to your retina, your doctor may obtain a B-scan ultrasound to help rule out a retinal tear or detachment. 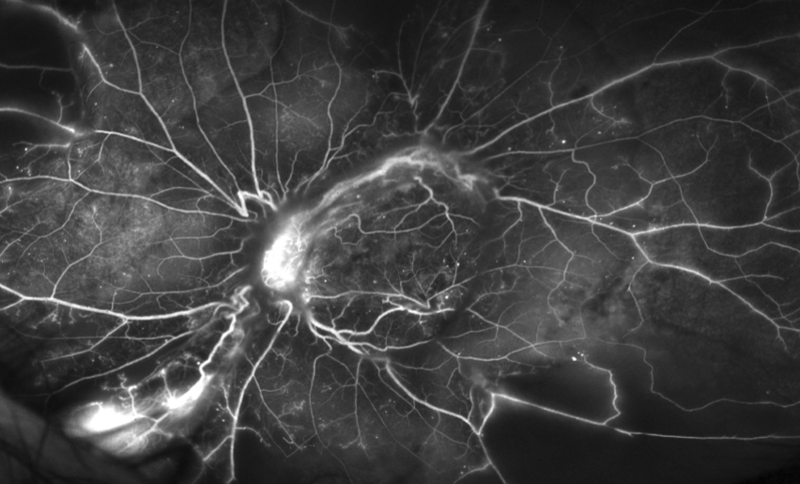 In certain types of serous or tractional detachments, your doctor may need additional laboratory work up or fluorescein angiography imaging to help investigate the cause of the retinal detachment. Your doctor will discuss the risks, benefits, and alternatives of the various treatment options. There are three main ways of re-attaching a detached retina: pneumatic retinopexy, scleral buckle placement, and vitrectomy. Your doctor will discuss which may be most appropriate for your individual case. In some rare cases of limited detachment, laser barricade treatment may be most appropriate. In this office based procedure, a gas bubble is injected into the eye which in turn covers the retinal break until the retina reattaches. A freezing treatment can be placed at the time of the gas injection, or laser can be placed at an additional visit afterward. The procedure has a good success rate in appropriately selected patients. It is critical that patients keep their head in a specific position until the retina is reattached in this procedure. Scleral buckles are placed in the operating room. A silicone band is placed around the eye and cinched like a belt buckle around the eye, bringing the eye wall closer to the detached retina, which facilitates reattachment. Usually freezing treatment is applied at the time of surgery to help close the retinal break. In some cases, the fluid is drained during the operation. The buckle can also be combined with a vitrectomy surgery. Vitrectomy is also performed in the operating room. In this procedure the vitreous is removed from the eye and the retina is reattached during the surgery. Laser or freezing is placed at the time of surgery, and a gas bubble is often left in the eye to help facilitate healing afterward. Often patients must keep their head in a face down position after the surgery. Laser can be used in unusual cases to help wall off the retinal detachment and prevent worsening in a small retinal detachment. Retinal detachments can cause significant visual loss. Treatments are effective at reattaching the retina in most cases, although in some patients, additional procedures may be required. The result of treatment can be variable, depending on preoperative characteristics, and how good the vision was prior treatment.